Here’s a cheerful little Thursday post. 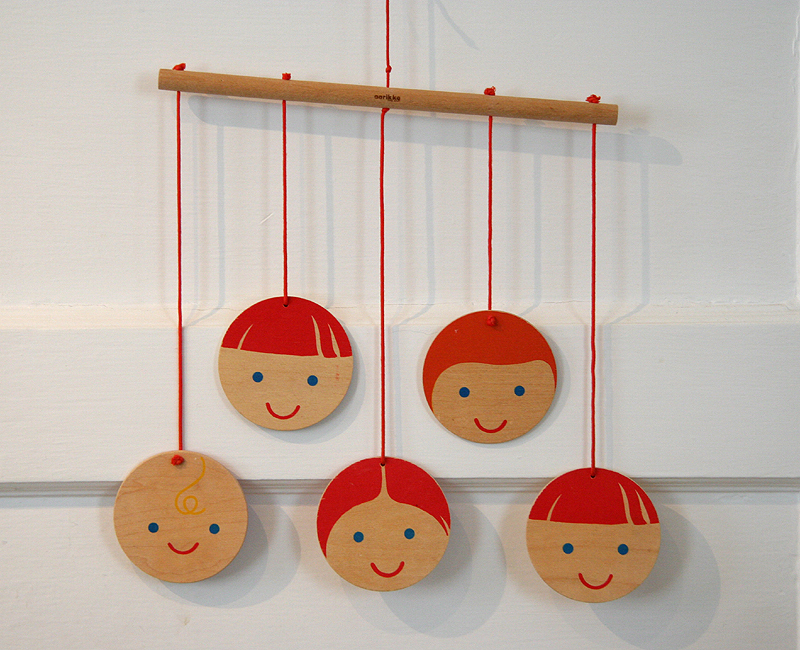 One of my favorite Christmas presents this year, a wooden mobile of smiling faces from my Mom. It’s an ebay find, by a Finnish company, Aarikka. How sweet! I especially love the little bald one with the curl. I’m in total and utter love! How incredibly awesome that your mom understands your style! The only “language” my mom and I share is cooking gadgets – we can buy for each other equally in this category. oh they remind me of sarah’s new batch of loop troopers! love this, and love that your mom is trolling ebay! So very you! Love it! Is it going into the baby’s space? It’s wonderful! I love Aarikka stuff, they make cool jewellery and Christmas decorations, too. TOTALLY your style- great job mom! i imagine you having things like this…what a great gift! Oh, your mother understands, doesn’t she? What a find! This is so cute and so you! So simplistic and yet so perfect. Ha, how funny, I was just at their site last week, stalking, er, researching a partner for a swap. I loved so much of what I saw there. What a great gift from Mom! How cute! I’m always on the look-out for Finnish cuteness. Thanks for sharing! So cute, wonder what search words your mum used to find that beauty! Oh it’s fantastic. I love it. Wonderful stuff. Simple things are the best. Adorable–it makes you smile just looking at all the happy faces. What a grand gift! this is unbelievably awesome! i never got holiday cards out, but a big big big happy new year!! Looks perfect for the new nursery? Oh my, this is ridiculously adorable!!! Lucky you! (I’m just a little bit jealous, haha) Well, merry belated xmas! My son is going to be 17 this spring and we had that same mobile hanging when he was a baby! super cute mobil. I’ve been looking for simple mobiles for my 8 wk old daughter, this one is so cute. congratulations on your pregnancy. May you have a wonderful experience. Thanks for writing. we love to read you. Holy cuteness I want to make them into earrings and necklaces! Now I am trying to translate the website. oh what a lovely mobile!